From the standpoint of bringing 57 swords, of 21 sword smiths, together makes this exhibition an astounding achievement. Since my early interest in the Nihon To surrounded the Soshu School I am always eager to see exhibitions associated with Masamune, his students or the Soshu School influenced works in general. Because this school was the shortest of the five main schools of forging methods I have found it to be the most elusive to the collector. I guess I have been exceptionally lucky because in the past 37 years I have been able to handle many of the better smiths from this school. My first Soshu piece was bought in 1965 at $150. It was a sunnobi Hiromitsu tanto. I had gotten it from a collector/ dealer in Japan who was teaching me on an almost daily basis. He comrmed me that the blade had a fake signature but was of excellent make. It was not cheap for me at that time but I was in awe of the hitatsura yakiba. I sold it some years later to be able to afford a Kawachi no Kami Kunisuke daisho. I now feel that I should have removed the signature and have put it to shinsa. I have always regretted selling the piece because it could have actually been a Hiromitsu or Akihiro. That was my first Soshu blade that started my interest and carried me to the Sano Bijutsu Kan this January to see their most recent exhibit. Most collectors new and old alike always get excited when seeing the great Soshu smiths. It is even worse when they can handle them. If you were at the Chicago Sword Show last Oct 2001 you would understand what I mean. Some of the collectors holding the swords in the meibutsu room were actually shaking while looking at the blades. I guess I have out grown that stage because I am no longer in awe of the importance of the pieces as Koku Ho, etc. I am interested in absorbing the work as best as I can so my concentration is on the jihada and yakiba and not the importance of the smith. I would say my lesson in looking beyond the smith’s name started in early 1967 while getting advice from Ono Koke Sensei. He handed me a Sadamune tanto and asked, " What is wrong with the polish?" I thought it looked fantastic. He went on to explain that the ha saki was not even but most important the jihada was hadatachi. It had been made to stand out too much loosing that wonderful softness of Sadamune’s jihada. On that same day I saw the Kokuho Rai Kuniyuki. In November of last year I was lucky to handle the Masamune kodachi (#20 in the Masamune catalog) and a Bunkazai Shintogo Kunimitsu. I sometimes think, I had better look at this blade longer or the person showing the piece will think that I really don’t understand or appreciate it. I guess that is because of my many years of handling swords and polishing them that I can evaluate and absorb the blades workmanship quickly and have gotten past the stage of the jitters. I believe that having been taught with Jutos and higher from my early days of study in Japan, that I find it easy to look at the blades keeping in mind what I want to see and learn. It was in this frame of mind that I sat outside the Sano Museum waiting for it to open thinking I wish I could handle the pieces. Just two days earlier I had told Tanobe San at the NBTHK that I was going to the exhibit. I smiled and said "All under glass, huh" He said " can’t really enjoy the yakiba that way but look them over good". That is what I did. We arrived early. I guess the lady got tired of seeing us (myself and Cary Condell) sitting outside the museum and opened the door and said we could come in. Actually Andy Quirt was to have been with us but unfortunately at 3 AM in the morning he came down with food poisoning. I might add that, if you can, you should visit the exhibition with another collector. This way you can make comments and suggestions about the blades aspects that the other might have overlooked. It is a much more enjoyable experience this way. I must add that Cary has out distanced himself from the greater portion of the collector field through his diligent studies of the Nihon To. He and I went from piece to piece trying to observe all we could, calling attention to aspects of each sword we thought was exceptional. What follows are some of the observations made of each sword and the accompanying exhibition catalog along with a bit of reminiscing throw in. Anytime you can see Awataguchi swords it is a chance you don’t want to miss. The pieces as shown in the catalog have great jihada. The koshirae with number 2 a Kunitsuna Tachi was fantastic and looked to have kanagu of solid gold. The Bizen Sukezane and the Kunimune (#5, #6) blades were great with their detached tempers and strong utsuri, which stood out almost like yakiba. Cary and I noticed that most of the swords owned by institutions have very old polishes and even had rust spots and a lot of hike. Those owned by private individuals were much better in the polish condition, which is probably due to not having to procure funding for upkeep. Numbers 3 a Tachi signed Sukezane and number 4 a katana attributed to Sukezane are good examples of what Kamakura swords are not thought to be. They are large examples that also show polishing styles. Number 3 has an old polish showing temper covered in an old hadori style, which has had the portion going into the ji, softened and some of the higher temper peaks are not covered totally. Number 4 has been polished in a sashikomi style and the kissaki shows many lines left from the narume work on it. Both number 4 the katana attributed to Sukezane and number five a Tachi signed Kunimune show that they have old polishes which have been cleaned so many times that the yokote sharpness has diminished. Number five was polished in an old sashikomi and seems murky but the utsuri stands out very well when you position your head just right with the overhead lights. The first six swords in the exhibition, even though the shiage has been down graded from many years of cleaning, are still wonderful to behold. The next six blades are by my favorite smith – Shintogo Kunimitsu. My first experience with a Shintogo was during my studies as a member of the Hachioji Kenkyu Kai. Murakami Kosuke Sensei was the head of the group and his deshi then (1965) was Nozaki Haruhisa. He had taken me under his wing and was very instrumental in my rapid growth in learning about swords. He used to tell me, " You have to see many good swords so that your vision will expand, if you only see poor swords your vision will be no further than your hand in front of your eyes". I recall there being a Kunimitsu daito at one of the study sessions and being told how rare it was I remember the most a Kunimitsu tanto, with a date, that I got a chance to see at the Shinjuku Toen Sha headquarters in 1967. This tanto was thin with a narrow suguba but the jihada was wonderful and has always been in my mind for the past 35 years. In November at the sword clearance I asked Mishina San what smith he liked the best and he said Shintogo. I believe many polishers and old collectors really like Shintogo works the most. That same month I saw a Shintogo tanto of Bunkazai class and it was fantastic. The jihada was outstanding and was similar to an Awataguchi Hisakuni tanto I had seen a year earlier. Number seven sword is a rare Shintogo Tachi with great jihada. In trying to use the available light, as best I could it seemed to me that the hamon was mostly hajime (see fig.1). 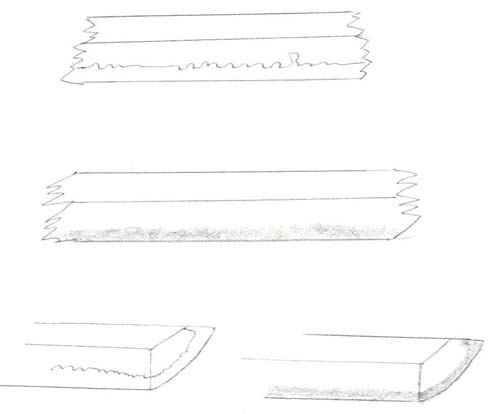 fig.1, blade comparisons of a distinct temper line and one with hajimi- an indistinct temper. no definite line. This sword is Tokubetsu Juyo Token and should be because it is an ubu tachi. The hamon seems to be made up of a thick nioi from the habuchi to the hasaki. I could not discern any of the thick ashi as shown in the oshigata from the catalog. The boshi was this same way but in the Tokubetsu Juyo Token Nado Zufu it actually looks like the boshi is drawn in. One has only to look at the other swords to see what I mean about the yakiba. The others have a distinct clear yakiba that shows up nicely even when looking at the side rather than down the blade. No matter what, this is still a rare piece, as I know of only 6 Tachi by Kunimitsu that are signed. Of these 6-signed pieces 3 are Tokubetsu Juto. There are an additional 5 osuriage attributed to just Shintogo. All that are not cut were long swords and in Juyo Token Nado Zufu #27 there is one that is 96cm in length. My records indicate that number 8 Kunimitsu has no classification. On page 145 of the catalog the bottom half of the page 2nd paragraph it says that Kunimitsu was not good at making Tachi and that they are few. It also says number 8 a Tachi signed Kunimitsu has a much brighter nie in notare chogi midare which is later found in Masamune and Hiromitsu with hitatsura. This choji style is from Kunimitsu’s teaching. The placement of the Mei is different from all the other Tachi in that it is all the way to the right and all the other pieces are to the left. Just an observation as I think the signature is all right. The other four tanto are self-explanatory as Kunimitsu was the master of tanto making. Numbers 11 and 12 tantos are primarily to show the working years of Kunimitsu. There are additional Jutos that are dated pieces also. Number 11 is dated Einin 1st (1293) and number 12 is dated Showa 4 (1315). 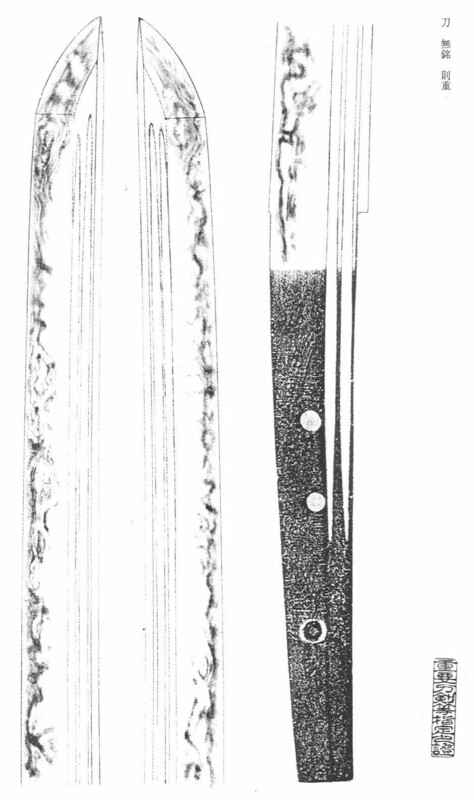 The other extant tanto of Juto class are dated Kagen ( 1306), Showa 1st (1312) and Genkyo 4 (1324). Sword numbers thirteen through sixteen are Yukimitsu pieces. The 1st #13 a signed tanto is from the Imperial collection. Daishimbo is thought to have done the horimono for Yukimitsu but this work shows the style of horimono that Yukimitsu worked in. Number 14 a signed Tachi is the lovely Kokuho that the jihada is wonderfully worked and full of nie. Number 15 a signed tanto I liked best because it really reflects the Awataguchi hada. This tanto is Tokubetsu Juto and looks to me that it could rate Bunkazai. A well crafted piece that one needs to look at the hada closely. In November of last year I saw a Bunkazai Kunimitsu that when I saw this Yukimitsu I felt as if I was looking at the Kunimitsu once again. The only difference being that this Yukimitsu has a slight sori and the Kunimitsu had a slight uchi zori. Both blades were pure and simple ito suguba hamon with no internal workings. It was told to me when I was cutting charcoal for Takano Sensei (1966) that that day he was going to make an ito suguba in a tanto he had hammered out in the past few days. He said that to do it in a tanto was the most difficult because the eye could take in the whole temper at once so if there were an irregularity it would show immediately. On a daito a slight jiggle might be over looked because taking in the total temper with curvature was not as easy. He considered the old smiths that could do a tanto in perfect suguba the best. He said doing a temper in midare ba was much easier. Takano sensei was my second teacher in sword polishing and was an accomplished sword smith, shirasaya and habaki shi. When I saw the Bunkazai Kunimitsu in November I was told, as it was handed to me, this is a rather not so exciting piece because it has no internal workings inside the yakiba. I was really taken by the simplicity of the perfect ito suguba temper with the great Awataguchi hada. It was just like this Yukimitsu #15 and if you are viewing this exhibit you should spend more time at this piece. A work of art. Number sixteen a signed Katana Yukimitsu Bunkazai. Be sure to look at the jihada. Actually get your catalog and fold the leading edge of pages into the spine and then look at blade #7 (pg.22) or #8 (pg.24) while being able to see #16 (pg.40). The jigane tells it all but the hamon of #8 and #16 are seven hundred-year-old twins with one having a few more wrinkles. Nothing else to say. According to the meikan there are records of dated Yukimitsu pieces from Kagen 2 (1304), Genkyo 2 and 3 (1322-1323), Gentoku 2,3 & 4 (1330-1331-1332) and Kemmu 1 (1334). These dates easily place Yukimitsu with Shintogo. Swords number seventeen, eighteen and nineteen is what I would say is the sword smiths swordsmith. Norishige. I say this because he not only made pieces in the Shintogo Fu but he explored and made the Matsukawa hada that has become his tokucho or point of kantei. That is for his later works. It is known that Yukimitsu, Norishige and Masamune were students under Shintogo Kunimitsu. The early dated pieces of Norishige look like Shintogo and don’t exhibit the matsukawa hada of Norishige’s later examples. Norishige ranks as equal to Masamune in ability and shows a skill in metallurgy not found in other Soshu works. That is his ability to make the Matsukawa hada. It is thought that Norishige and Masamune were trying to copy Hoki Yasutsuna swords and it seems as though Norishige became the most skilled at doing that. When a blade has long intertwined chikei the appraisers will say it is either a Hoki or Norishige showing that Norishiges work looks closest to Hoki. My Ko Hoki daito was a very good example of that. It had a hamon that would be seen in the later to come Soshu School. We all new Norishige was a good sword smith because of his connection to Masamune. Actually though with in the past century it seems he has been rated as good as and not a student of Masamune but as a contemporary. In the past several years I have been gleaning all the comrmation out of my old books about him. It is interesting to note that most if not all the authors consider his work amongst the greatest of all smiths. I keep finding interesting statements in all of the writings such as; the combination of steels creating the great chikei was a height of excellence not attained by Masamune. Fujishiro Toshio says, " Even though I have had second thoughts about the excellence of some of Masamune and Go Yoshihiro works I have always found Norishige’s work outstanding". Another interesting fact is out of the past 15 Tokubetsu Juyo Token shinsas there have been 15 Norishiges sword selected and only 12 Masamune selected. Is this a statement of overall quality? Maybe a consistent quality? Back to the exhibition, sword number 17 a tanto signed Katsu Norishige Tokubetsu Juyo Token is interesting in that it has the kanji Katsu or sho above the signature. I have asked about the meaning but no one seems to know. I would speculate it has something to do with winning. When I see this kanji it reminds me of my sumo watching days when the TV would display the number of bouts won. Such as 1 Sho, 2 Sho, etc. I guess it has something to do with superiority, to win, gain a victory, triumph over or overcome difficulty. Then possibly it means something else. Perhaps it was a winning piece in a tanto-making contest between Norishige, Masamune, Shintogo Kunihiro and Ni Dai Kunimitsu? Well, no one knows so I can make up my own story. This Norishige blade in size, hada and nie deki hamon is all in keeping with Shintogo influences. The Showa 3 date (1314) is right on for being a student of Shintogo. There are two other dated tanto that I have seen and they look like this work in size and deki. Both are Juyo Token and both are signed Saiki Norishige. One is dated Geno 1 st (1319) and the other is Geno 2 (1320). The catalog lists the era of Enkei 3 (1312) being the earliest date for Norishige along with the Showa 3 (1314) date and another of Bunpo 2 (1318). The Meikan lists Enkei 2 & 3 (1309-1312), Showa 3 (1314), Bunpo 2 (1318), Geno 2 & 3 (1320-1321), Genkyo 4 (1324) Shochu 2 (1325) and Karyaku 3 (1328) as dated pieces by existing works or old oshigatas. Number 18 a signed Norishige tanto is a Kokuho with the same proportions as the Shintogo tantos but taking on the matsukawa hada effect with a vigorous hamon. Number 19 a signed Norishige Tachi is the only signed Tokubetsu Juyo Token with a signature at the bottom of the nakago but still 72.2cm in length. Cary and I spent a good deal of time looking at this particular blade. The polish seems to be fresh and the hadori very well executed. Here again this work is great to see because it looks early and we are both very familiar with the work produced by Norishige. I kept trying to see more of the internal hamon work but looking from the side was difficult. I just think that there must be more hataraki than what is shown by the oshigata. There was no question that Norishige was a direct student with Shintogo. Number 20 a Kodachi signed in red lacquer Masamune was the first of the Masamunes that were on display. This is an excellent example because it is ubu and shows the shape of nakago done by Masamune. Last Nov I had the opportunity to examine this sword at my leisure and I was most impressed because it is what I had always imagined a Masamune to look like in the yakiba. I have handled and examined Masamune pieces but I always felt there must be more than what I was seeing. This piece didn’t leave me feeling that way. If you can bend down to get the light reflection just right you can see the great hataraki and depth of the nie going right to the hasaki. Spend a good deal of time looking at the ura about just in front of mid blade and you will see the nie flowing upwards through the ji. This sword is owned privately and of the Tokubetsu Juyo Token class. It is a Kishu Tokugawa heirloom that you should take your time studying. I didn’t mention earlier but I feel that most of the oshigata in the catalog are a bit too harsh and don’t show off the wonderful internal workings inside the hamon. Tanobe San had produced some of the oshigata and Hiroi San did the rest. You can make up your own mind just by making a comparison. Tanobe San did oshigata numbers 6,7,15,17,20,27,28,50,51,54. These have a softness and feeling of the nie surrounded with nioi that is surely evident in the yakiba. All other oshigata are void of this, which is what makes looking at Soshu swords so enjoyable. A good example is to open your catalog to #27 and then pull the page back to reveal #26 and then #25 the Meibutsu Hyuga Masamune. Now you will see what I mean about the feeling. You can also pull #21 back to reveal #20. The number #20 oshigata is drawn the way the hamon looks while #21 I can assure you doesn’t look this stark. Number 21 is the National Museum Kokuho and has a nie and nioi depth that goes to the hasaki. Enough on this subject. You can come to your own opinion. On the Masamune swords I would tell you to look at the jihada and concentrate on picking out the wonderfully pronounced chikei. It is difficult to see all the hataraki from looking at the side so pay more attention to the working in the jihada. Number 33 a tanto attributed to Masamune was very hard to enjoy the hamon, as it seemed weak under the hadori. Possibly the hamon is somewhat soft in comparison with the other Masamune swords in the exhibit. A sword that doesn’t have a good strong temper will take a hadori more readily and it will be harder to see the hamon when looking from the side. Maybe that is why this piece is only Juto. It is the Komatsu Masamune but is a Juto as den Masamune. Numbers 34 and 35 both tantos are the two Meibutsu Hocho Kokuho’s. Personally I never liked the shape but a viewer must look at the kitae to understand that these are superior works. There are three such Meibutsu Hocho. I would have liked to have seen the one with the sukashi gomaboshi on display as well, as it is superior in hamon work. Numbers 36 is the famous meibutsu Kiko Sadamune katana. Look this jigane over good, as it is fantastic. I tried to follow the kinsuji as it went out of the habuchi and turned to chikei in the ji. A very striking piece with its sori and futasuji bi. There are 6 Sadamune and all of them are listed in the Kyoho meibutsu cho. Number 37 a tanto attributed to Sadamune and number 39 another tanto attributed to Sadamune as far as I can tell have no rating other than being listed in the Meibutsu cho. My favorite of these is the Fushimi Sadamune Number 38 a wakizashi. The chikei in this piece makes it outstanding. Including daito, wakizashi and tanto the NBTHK has only made 53 Sadamune pieces Juyo Token or Tokubetsu Juyo Token. Number 40 a wakizashi attributed to Sadamune and number 41 a wakizashi attributed to Sadamune have a larger yakiba and there are tobiyaki. Look these pieces over well. Number 41 the Meibutsu Monoyoshi has the shiage degraded but still worth studying. Go Yoshihiro is represented by three Meibutsu pieces number 42, 43 and 44 all katanas. All three are Bunkazai but my favorite is the Matsui Go. It has many chikei. Any opportunity you can get to see a Go you should because they are so few. There are only 33 rated Juto or Tokuju. A friend has one and I get to see it every couple of months. Some Go swords have more masame. See if you can find which of these three has that trait. You will find that most of the Go hamon get higher in the monouchi and have the boshi set back. This is not always the case. Numbers 45,46 and 47 are Hiromitsu and Akihiro Sunnobi wakizashi of the mid Nambokucho jidai. The two Hiromitsu are Jubi and the Akihiro is a Tokubetsu Juto. It was a Kuroda family heirloom. These pieces represent the 3rd period of Soshu work. Take note that the hitatsura of Hiromitsu pieces show through out the width of the blade where as the Akihiro is more in the upper portion. These three are thoroughly enjoyable to view. Hiromitsu and Akihiro daitos are almost non-existent except for one or two which is attested to by the fact that there are 32 Juyo Token blades (29 wakizashi and 3 tantos) as of this year. Rare pieces to see. Blade number 48 is a Wakizashi signed Soshu Ju Masahiro and is from the fourth period of the Soshu School and this Masahiro is the last of the Nambokucho jidai being dated 1392. There are several pieces dated Joji ( 1362) which show a closer relationship to Hiromitsu. This piece I thought to be Ni Dai while looking at it and now I have noticed in the back of the catalog it is listed as a Ni Dai. This being toward the end of the school shows a good tight jigane. The hamon has lost the vigor of the earlier pieces and shows it. It is still a good example to put away in your memory for reference. This piece is a Juyo token. Number 49 a katana signed Soshu Ju Hirotsugu and number 50 a Tachi signed Soshu Ju Tsunahiro are from the tail end of the fourth period and the fifth period. The Hirotsugu daito is not as nice as his tanto work but still a good example of the later work. The Tsunahiro is a Juto piece and has nice kitae with suguba hamon and clearly shows the demise of the famous Soshu school. Number 51 a signed Kunihiro katana I was able to handle about a year ago. This Kunihiro is a great copy of a Sadamune. It was given to me with the tsuka on and asked what I thought. My response was that the horimono was not worn away but cut that way and the boshi was like Kaneuji with the rest of the yakiba looking Shizu or Soshu. I just figured it to be Keicho Shinto because it was so straight. This blade is slightly machi okuri about 1 ½ inch but still it is Tokubetsu Juyo token. It is a good example of a Soshu utsushi (copy of). The remainder numbers 52 through 57 in the exhibit are later smiths that have tried to imitate the Soshu school works. The Yasutsugu wakizashi number 52 is a copy of a Sadamune and shows why they were selected to do many of the retemper of burnt Soshu swords. Number 54 a Shigekuni wakizashi is a Tokubetsu Juyo Token that I had seen twice before and it is a really good copy of a Sadamune or Masamune. The hataraki is really spectacular especially on the omote from the tip of the ken to the kissaki. Look this piece over good. Number 55 is a great Shinkai; he was called the Osaka Masamune. This piece is Tokuju and shows superb work. An excellent example of how the Shinto smiths were really trying to make copies of Masamune. The Kotetsu katana Number 56 and Kiyomaru katana number 57 were really trying to emulate the hamon of the early Soshu. These pieces have an abundance of chikei. I think the Kotetsu is a Go Yoshihiro copy and Kiyomaru is probably supposed to be a Masamune copy. There were other items of interest on display other than the swords. Some of the early reference material was good to see as well as the old shirasaya with sayagaki were of much interest. The niju daisuke habaki are always interesting to me. The fukuros with the name woven into the bags are a good example of the importance that was placed upon these swords. The overall display of the swords was excellent. I would have liked to see some of the swords moved closer to the glass. Some pieces were illuminated with halogen bulbs and looked great while the next one had poor 120-watt bulbs making it hard to see the great work in the blade. A few pieces seemed to have some weak areas in the hamon while one piece has a hagiri. See if you can locate it. I had originally intended to just review the Masamune exhibit in a page or so but got carried away with my own experiences and research. This outstanding exhibit will be at three other locations through June 2002 so I hope that some of my observations will be of help to those that take in these wonderful swords. Additional comrmation I left out of my previous ramblings that may be of interest and or importance. Number 20 on page 48 & 49 in the catalog are the wonderful Tokubetsu Juyo Token Masamune kodachi. This sword was well liked by Dr. Homma Sensei and he had it in his mind to see it elevated to the Juyo Bunkazai class. He passed away before he was able to get that accomplished. I have added the Juyo Token Nado Zufu page of my Norishige so that it can be inserted into the catalog by the Masamune kodachi #20 for comparison. There is a great resemblance of these two hamons showing there must have been a connection. While at the Sano Exhibition, I did not purchase a catalog until I had completely exhausted my feet looking at the swords, etc. It was later while adding my written and mental notes to the catalog that I realized that the Bunkazai Masamune #23, shown on pages 54 and 55 of the catalog, are not correct. In looking at the inazuma turning to chikei in the ji of the photograph on page 55 I wondered how it was drawn in the oshigata. I was amazed to find that the omote nakago and ura monouchi oshigata are not of the Bunkazai Masamune. They are of some other blade that has nothing to do with this catalog or exhibit. In addition to noticing these mistakes I have noticed several of my own. These below corrections apply to the article in the JSSUS magazine not on the website. Page 4 3rd line remove the second to. Page 5 line 9 change Kareki to Karyaku. I have found that Kareki and Karyaku are used as the reading for this kanji. To keep it as it is read in the catalog on page V under Exhibits for reference tanto 2 I have decided to change it to Karyaku. Also on page 5 second to the last line should read numbers 34 and 35 instead of 33 and 34. Page 6 line 17 should read number 41 instead of 42.